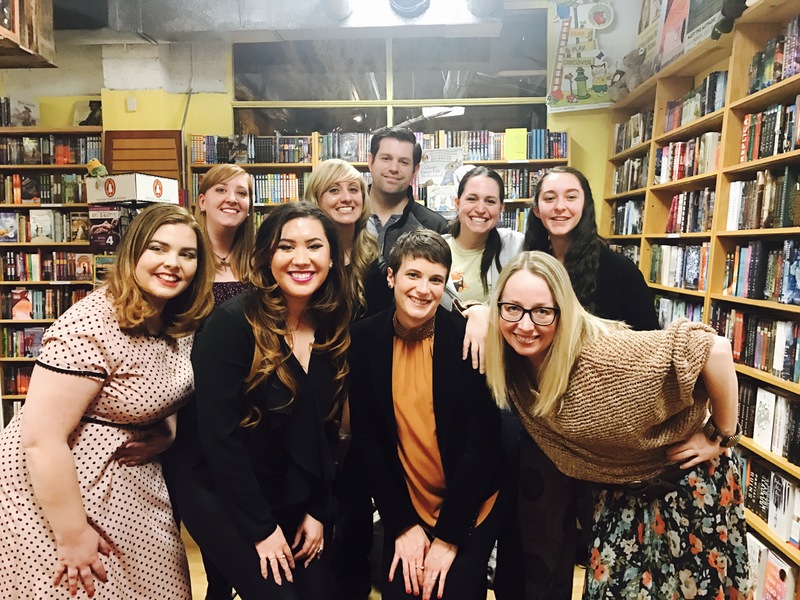 We had such an amazing time getting to meet these incredibly intelligent and talented women during the Penguin Teen Tour’s Salt Lake stop tonight. The authors were, of course, Renée Ahdieh (The Wrath and the Dawn), Lesley Livingston (The Valiant), Natalie C. Anderson (City of Saints & Thieves), and Alwyn Hamilton (Rebel of the Sands). 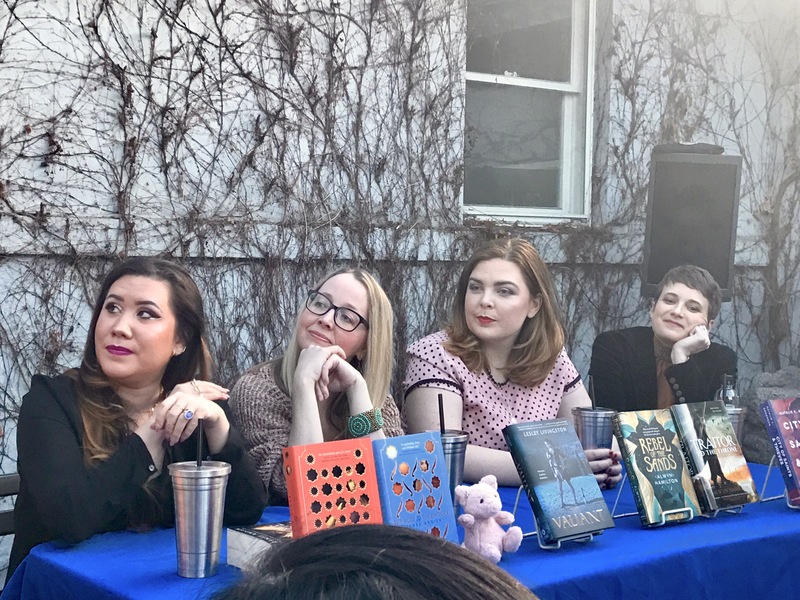 Every single one of these ladies’ books were five-star reads for me, so I was so thrilled when I found out they were making a stop here, and getting to meet them more than lived up to my expectations. If you haven’t checked out their books yet, make sure you do. They all feature female protagonists that are every bit as intelligent and awesome as the authors are themselves. I was so impressed listening to all four of them discuss their writing processes and the amount of time and research they put into their books. The amount of work they put in certainly shines through the text when you’re reading, but getting to listen to them actively discuss it was eye-opening and really makes you understand and appreciate the books that much more. The authors were not only intelligent and fascinating to listen to, they were also kind and hilarious. Such an entertaining panel to listen to. They have a couple stops left, so if they are making a stop in a city near you I highly, HIGHLY recommend going. Check out the remaining tour stops here! 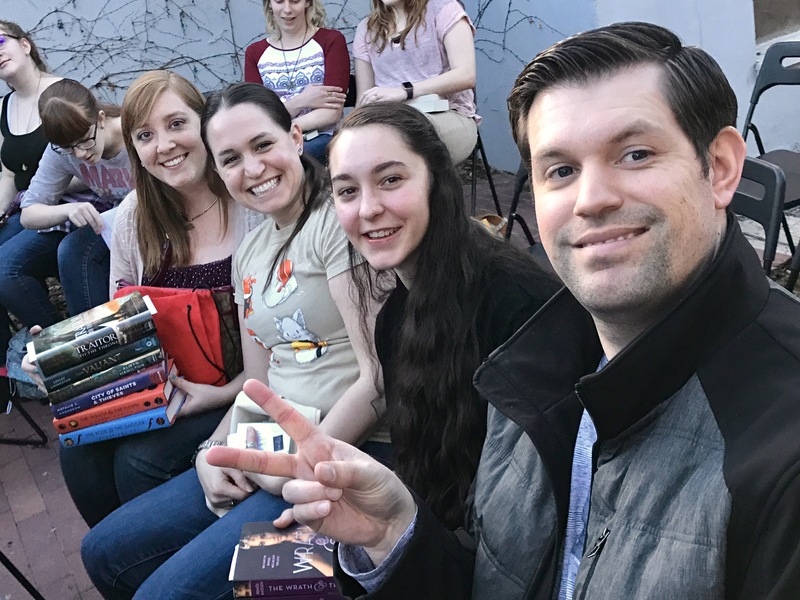 We, of course, had some of our fabulous YA and Wine book club members in attendance this evening, along with the book club hubz, and we all had an amazing time. 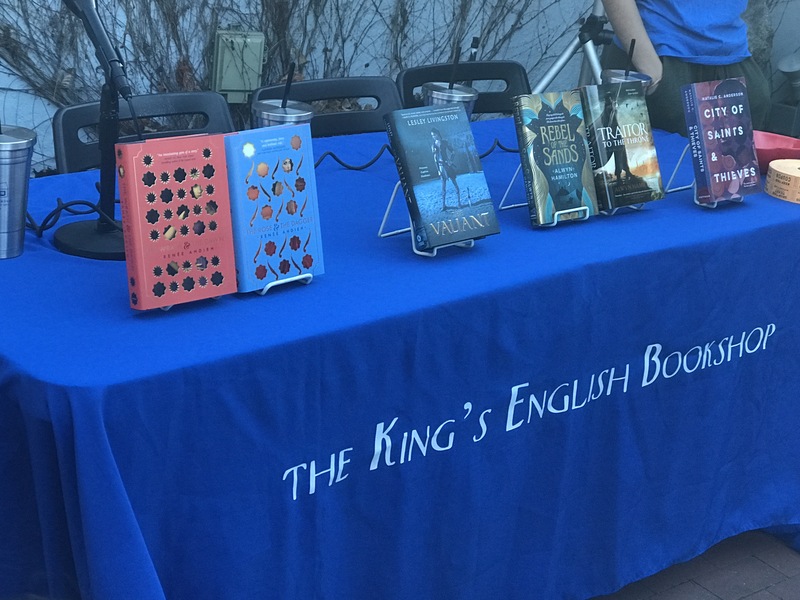 The King’s EnglishThe King’s English always goes out of their way to support us, and I’m extremely grateful to them for not only hosting this event, but for making the night even more special for us. This contest will end Sunday March 19th. Open in the U.S. only. So sorry about that, but shipping is so expensive! Have you read any of the books featured in this Penguin Teen Tour? Which ones were your favorite? Have you got to meet any of these incredible authors yet? Third time is the charm, right? I’ve been frozen out twice before, so let us hope. But every time I see these wonderful ladies, they’re always crouching down, and Lelsey Livingston has soooo gotten the hang it by this picture. XD yet another wonderful event post, and I desperately need to get the rest of these books since you gave them all five stars!! Hahaha! Yeah, I think they have the book event and photo opp down to a science! Lesley was so hilarious and awesome. We were all very entertained by her. They are all amazing books! I think you would definitely love Alwyn’s books! She gave away a couple Flame ARCs. I was so bummed I didn’t win, but I did win a cool tiger scarf. 🐯 All their books are incredible IMO. has caught my attention multiple times but I kept forgetting to actually add it to my TBR list. It’s on there now. 🙂 I might just add some of these other writers’ work too! Thanks for sharing!! And how neat that you’re doing a give away, too! 😀 Your blog is just always full of fun surprises! Oh, thank you! It was such a fun event! These authors are all just incredible. I really hope you enjoy Rebel. I absolutely loved that book. It has one of the best opening lines ever! Also, this post reminded me that I have an author event post to create myself! I had best get on that. Thank you! We are always having fun at our author events for sure! I LOVE all these books. Penguin basically created a dream tour for me. Ooh, I’m excited to see what event you post about! I get to meet these amazing people tomorrow! Super excited! Yay!!!! Oh, you’ll have so much fun! I’m excited for you! I haven’t read The Flame in the Mist yet, but I’m going to as soon as my eARC comes through. I was lucky enough to secure a copy through First to Read, so I’m looking forward to that. I enjoyed The Wrath & the Dawn very much and will read The Rose & the Dagger eventually, but I’m worried there will be a lot of heartache, so I need to steel myself for that one! I’m not sure if I’ll read The Valiant yet. The description wasn’t a huge draw for me, but it is getting a lot of good reviews. I think I will borrow it from the library first to make sure I like the writing style and then purchase it if I do. I’ve got Rebel in the Sands on my Currently Reading shelf at the moment and it’s going a bit slow. I’ve got mixed feelings about it and I think it’s going to come down to what happens in the last 30% that decides my opinion of the overall book. Oooh, you are lucky! That book sounds so amazing from what she was saying the other night. I love all of these books, and I love that Penguin grouped these authors together for the tour, since their books all feature such amazing female characters. These are all right up my alley though. City of Saints & Thieves is a little further outside my usual wheelhouse, but I loved it every bit as much. I wasn’t sure about City of Saint & Thieves when I read about it. It’s kind of in the middle of maybe for me right now? I very recently finished The Wrath & the Dawn series and absolutely fell in love with the books! Now I absolutely need more! 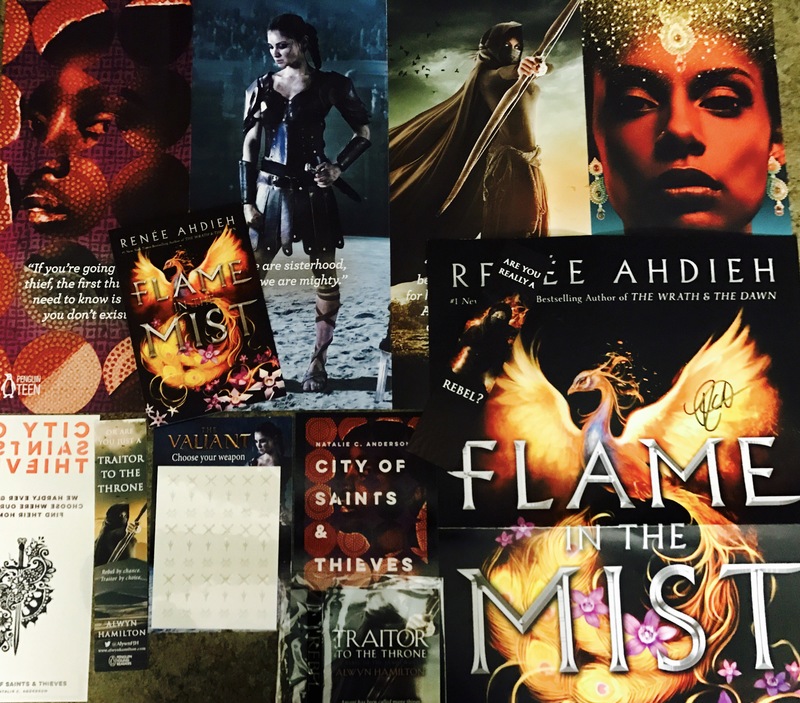 I’m dying to read Flame in the Mist! Thanks for the wonderful giveaway! I’m dying to read Flame in the Mist as well! Thanks so much for entering!